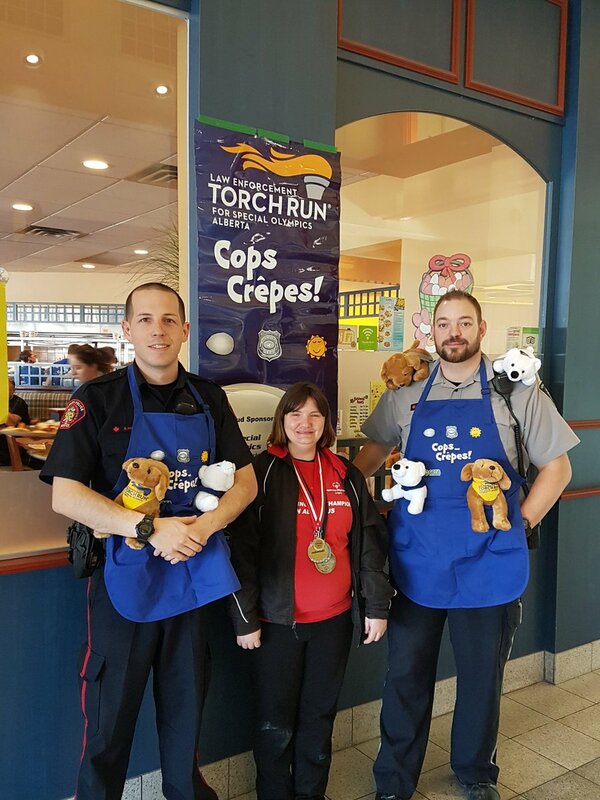 On March 11th and 12th, Law Enforcement Torch Run for Special Olympics Alberta served up coffee and smiles in 14 Cora Breakfast and Lunch restaurants throughout Alberta raising over $47,000 for Special Olympics Alberta. More than half the funds raised were the result of generous donations from Cora patrons. Cora Breakfast and Lunch restaurants were taken over by officers along with local Special Olympics athletes who happily served up hungry customers to raise funds and awareness. 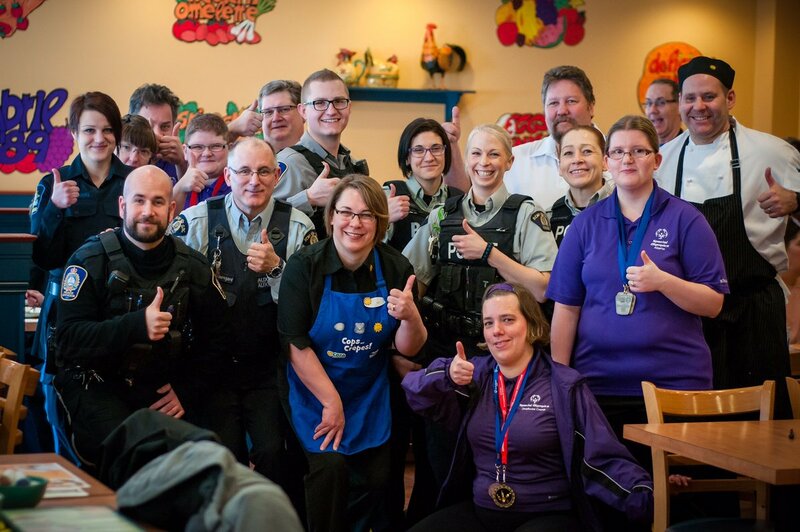 Over 120 law enforcement members partnered with 65 athletes province-wide to clear tables, greet customers and share inspiriting stories about Special Olympics. Cora Breakfast and Lunch has been a proud partner of the Cops and Crêpes fundraising event since 2009 where it started in one restaurant location in Okotoks and grew to be a province-wide fundraising event. Local representatives from Edmonton Police Service, Calgary Police Service, Alberta Corrections, Alberta Sheriffs, Fish & Wildlife, RCMP and Municipal Bylaw Enforcement generously volunteered their time to be part of this event. On March 10th Camrose held it’s first ever Cops, Pops & Pizza in support of Special Olympics. 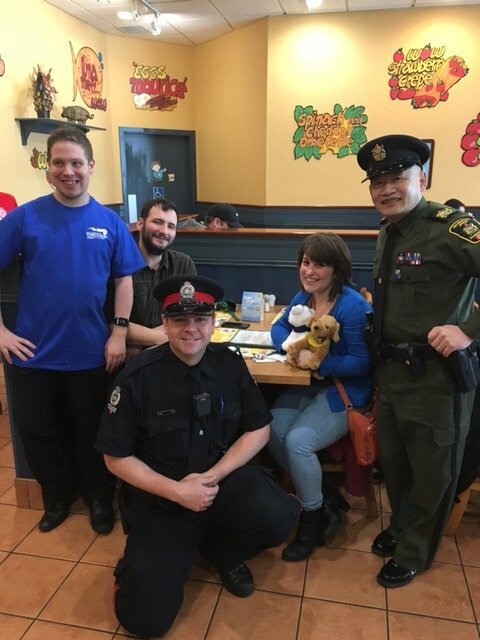 Members of Camrose Police Service, Camrose Fire Department and Emergency Medical Services partnered with Special Olympics athletes to serve customers at Boston Pizza Camrose. A huge thank you to all our Finest and Boston Pizza for helping to raise over $4,000 for Special Olympics! A huge SHOUTOUT to all the servers that donated their tips!! On March 11th Medicine Hat held its first ever Polar Plunge for Special Olympics! We had over 100 individuals register to brave the cold, raising over $18,000! We were honoured to have MP Glen Motz, Speaker Robert Wanner and Mayor Clugston join us to help kick off our first ever Plunge. Thank you to all our sponsors: William Huff Advertising, City of Medicine Hat and SpaTacular Spas. A huge thank you to all those that supported this year’s Plunge! On February 25th , Alberta Law Enforcement Torch Run for Special Olympics presented the Polar Plunge Calgary. 170 plungers braved the frigid waters of Arbour Lake while hundreds of spectators cheered them to plunge into icy glory. This year Calgary raised over $55,000 for Special Olympics Alberta including donations and sponsorships for the event. Thank you to our wonderful sponsors: William Huff Advertising and Arbour Lake. Headline Plungers this year included: Calgary Stampeder Alex Singleton, Former Olympic Gymnast Kylie Stone, Calgary Police Service Deputy Chiefs Parhar, Cook, Ritchie and Robitaillie, Tsuu T’ina Police Chief Blake, and Calgary-Hawkwood MLA Michael Connolly. A HUGE THANK YOU to all those that braved the cold and raised funds for our Athletes!